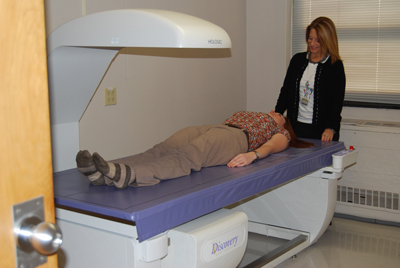 Franklin Hospital’s DEXA Whole Body Composition Scan is the most common method used as a clinical tool to investigate bone and body composition outcomes. The DEXA scan provides detailed evaluations of body fat, muscle and bone densities, and are printed and provided to you immediately after the scan. The DEXA scan can also be used for children and can detect the relevance of obesity in adults and children. Franklin Hospital patient Carolyn and Imaging Director Daniell Weinhoffer, standing, demonstrate the use of the DEXA scan. 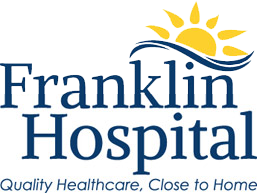 With more than 100 years in combined Radiologic skills and knowledge, the Imaging staff at Franklin Hospital is ready to assist with your healthcare needs. Our caring staff puts YOU first. We will work around your busy schedule and make sure that every effort is made to make you comfortable while providing you with the best diagnostic images possible. Lois Waters is registered in the American Registry of Registered Technologists in Radiography and Mammography. Dale Bayless is registered in the American Registry for Diagnostic Medical Sonography in Vascular Technology. Tracy Minton is registered in the American Registry of Registered Technologists in Radiography, and computed tomography. Tressa Morgan, Shelby Brauer, Katherine Cain, Kassie Spencer, Kacee Roberts and Lindsay Crane are all registered in the American Registry of Registered Technologists in Radiography. To schedule an appointment, please call 618.439.3161, ext. 9420 and speak with any of our knowledgeable Radiographic Technologists.